Blog home Deals Our egg-cellent Easter holiday deals! Forget about finding the best chocolate eggs this Easter, we’re all about finding the best holiday deals. Falling in mid-April this year, the Easter holidays make an ideal time to jet away for some pre-summer vitamin D as places across Europe see temperatures rise above the twenties and those further afield get even hotter. Get £25* off this Easter! 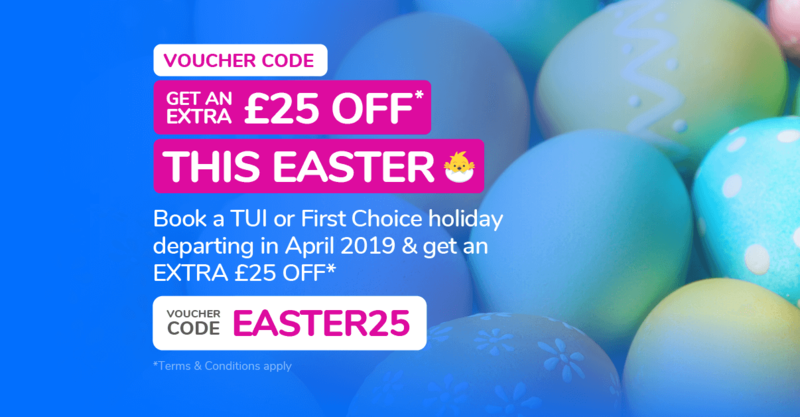 Get an extra £25* discount per booking on TUI and First Choice Holidays booked from Friday 29th March to April 22nd. Use code: EASTER25 on the Travel options page. *Min spend £600 per booking. Valid on holidays departing between April 2019. T&Cs apply. So why not check out some of the best holiday deals below and save big when booking with Holiday Hypermarket! Costa Del Sol has every reason to be called the sunshine coast, thanks to its offering of around 320 days of sun every year. If you’re travelling as a family, you won’t be short of things to do. Resorts such as Fuengirola and Benalmadena offer heaps of activities including waterparks and zoos. If you want to step back in time, pay a visit to one of Costa Del Sol’s old Spanish villages such as Nerja or Frigiliana. Both are steeped in tradition with an authentic Andalusian feel. With a coastline stretching a whopping 161 kilometres, blue flag beaches are in abundance, making Costa Del Sol your number one choice this Easter. With well-known family resorts such as Alcudia, Cala Bona and Puerto Pollensa, Majorca needs little or no introduction. Travelling to Majorca takes little effort and with a flight time of around 2.5 hours, the kids and adults could be splashing around in the pool in no time. The beaches in Majorca are family friendly with crystal clear shallow coves for the little ones to paddle in. If you’re travelling as a group or a couple and are looking for something a little livelier, head to the popular resorts of Magaluf and Palma Nova, where you can party into the small hours. Portugal is made up of its mainland and neighbouring islands Madeira and Porto Santo. The Algarve, located on the mainland is certainly king of the castle when it comes to its stunning coastline. Beautiful beaches and small sandy coves give families long endless days of fun in the sun. Alvor and Carvoeiro have kept their traditional village charm and are a great choice for a family holiday. If you fancy something a little livelier Albuferia is a more upbeat resort offering you trendy cocktail bars and after hours’ nightclubs. Jet off to Portugal this Easter and you won’t be disappointed. Nicknamed the have-it-all islands for a reason, the Canary Islands are the ultimate crowd pleaser. Thanks to their location being way closer to Africa than it is Spain, each island benefits from 20+ degree heat all year-round. Although they share the same climate, they all have something different to offer their holidayers. Take Tenerife for example, here you can take a cable car up to the world’s third-largest volcano, Mount Teide. Or, in Fuerteventura, take part in some of the best watersports in Spain. No matter which island you choose, there’s guaranteed to be something for you. Brimming with Blue Flag beaches, age-old sights and a sprinkling of spice markets, Turkey offers holidays that are one of a kind. For families it’s got tons of adrenaline-pumping activities and miles of golden beaches. As for those after an adult-only escape, you can step back in time and learn all about its left-behind landmarks or hit the bazaars and boutiques for some retail therapy. Whatever type of Easter holiday you’re looking for, you can have it in just under a four-hour flight time and enjoy pleasant temperatures of around 18 degrees. Bask in temperatures of 30+ degrees on a holiday to Egypt this Easter. Choose between its main resorts, Hurghada and Marsa Alam — both offering bundles of beaches and an impressive line-up of All Inclusive hotels. Activity wise, you’ll get the chance to swim with exotic fish in the Red Sea — home to some of the best coral reefs in the world. And with both resorts being backed by desert, there’s plenty to do out of the water too. Head out on a safari where quad bikes, camels and dune buggies will take you for a family day to remember. With huge savings to be made, there’s never been a better time to book your Easter holiday! Start your holiday search here. Read previous Save on your next Summer escape!